Last week saw police raids on refugee housing squats and camps across Greece, which resulted in the demolition of a long-term refuge space and a hundred refugees and accomplices arrested and hauled off before the courts. One of them, Can Simit, reports from Thessaloniki. Orfanotrofeio, squatted and active since 2009, being demolished. Three refugee housing squats in Thessaloniki were raided at 5:30am Wednesday 27th July 2016, and 74 people involved in the maintenance of the spaces were arrested. In court, on Thursday 28th, charges against the 74 included ‘disruption of the public order’ and ‘property damage’ (£70,000 Euros), and an additional charge of disobedience for those who refused to give fingerprints. The cases have been divided according to each squat, two of which were adjourned until August 3rd and 5th, due to the need for translators for the variety of people snatched-up by the militarised police. The verdict against seven people arrested at the third squat was to dismiss two non-Greek people, giving the remaining five suspended sentences of four months. One person’s previous convictions meant that their suspended sentence was increased to a 25 Euro per-prison-day fine, amounting to around 3000 Euros, which is to be challenged under new legal changes. The same day, living spaces and squats in Athens were also raided and evicted. 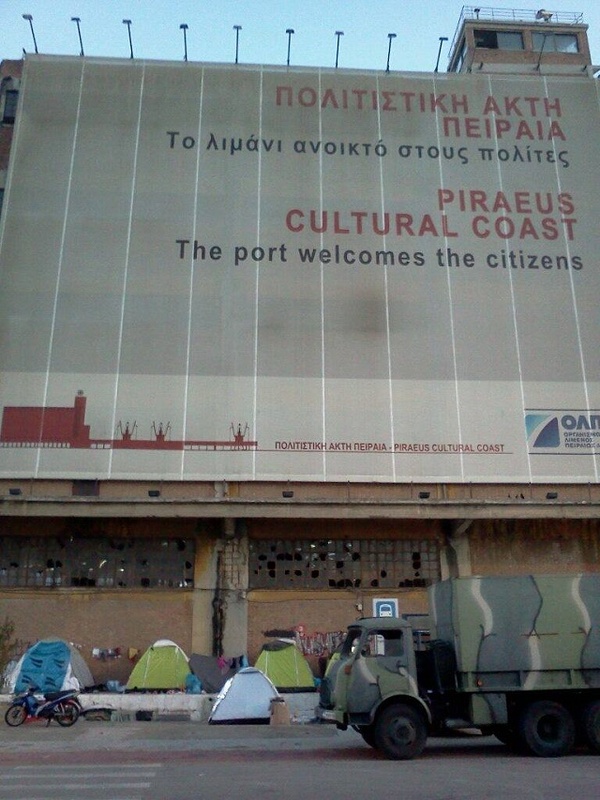 The Piräus camp, at the harbour in Athens, was simultaneously evicted (see photos); with statements from the Mayor that he supports further evictions of refugee solidarity spaces in the capital city. The motivations for the violent evictions and repressions, against self-organising refugees and their accomplices by the fake-left SYRIZA government, include attempts to assert control over a situation which is wildly beyond the means of the state. The motivations include the spectacle of appearing to be tough on migration, enforcing ‘Fortress Europe’, being tough on anarchists and tough on anti-state solutions to state-border problems. The motivations continue; in-line with the previous shutting down of protest camps of Idomeni and Northern Greece. The motivations are precisely racist, authoritarian and Eurocentric. Solidarity is being criminalised. Two squats, Orfanotrofeio and Nikis, were longer term, established projects, while Hürriya was utilised soon after the No Border Camp at Aristotle University, mid-to-late July. For these reasons, the Hürriya squat was more heavily populated on the night of the raid by the militarised cops. 64 people were arrested there on orders of the ‘private owner’. Over 30 refugee residents were arrested and taken to military detention centres, from which they were promptly supported to leave by accomplices. The 64 people from Hürriya, who were kept in jail for 30 hours without food or sleeping places, were allowed to leave and may be represented by lawyers during the trial without appearing in person. 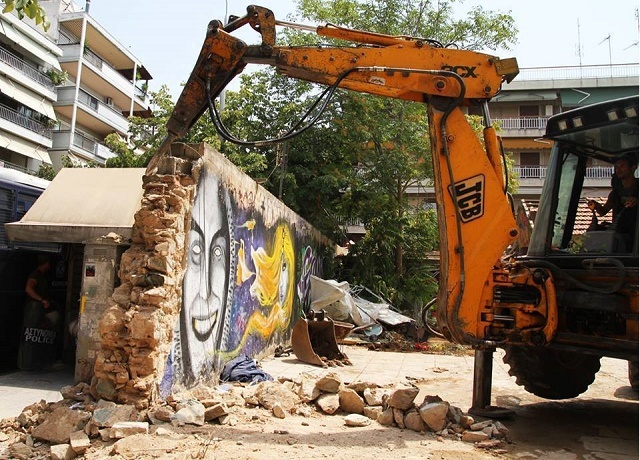 The Orfanotrofeio squat was bulldozed to the ground right after the eviction (see pictures). It does not exist anymore. Residents are now housed by friends and accomplices, their belongings buried deep in the ground. The Nikis squat, a university building, has been in use for seven years. The defence of the long-term space included the necessity of such places whilst people live in social and economic vulnerability. Targeting those responsible, direct action in the form of occupying the SYRIZA offices began on Wednesday morning and remained until all imprisoned people were freed. 300 people seized the moment of release of prisoners to demonstrate directly outside the party offices on Thursday. Another action, taking pro-refugee-spaces propaganda to the Church (a private business) which claimed ownership of the Orfanotrofeio squat and called for its instant demolition, resulted in a further 25 arrests. All those arrested were found not-guilty at court the following day, after a night locked-up in the barren cells. However, all who refused to submit to having their fingerprints recorded (and therefore denying their data collection by Interpol, to be shared with Schengen states) were given six month suspended sentences. Being found entirely innocent whilst refusing to be put on a ‘criminal database’, apparently an irony lost on the judges. The logic? All must submit to authority. STATEMENT OF DEFIANCE: Communiqué from numerous autonomous people detained in the Hürriya eviction, one of three refugee housing squats evicted in Thessaloniki, Greece, on 27th July 2016. The writers are white Europeans. The struggle of and with refugees is nothing short of absolute necessity. The needs for housing, for basic dignities, food and medical requirements are not met by existing powers. Refugees continue to drown at sea and die in prison camps while freedom of movement is available only to the most privileged. With this simple and obvious understanding, people must organise ourselves. The abject failure of the state, of all states, of NGOs, institutions and their allies, is evidence enough of the necessity of autonomous action to meet the needs, desires and dreams of the people. While the pseudo-left SYRIZA government, the Church (a private business) and Aristotle University, flip between hollow compassion-propaganda concerning refugees and ordering the violent eviction of three refugee housing squats, one of which has been raised to the ground with bulldozers, there is no mistaking their racism, their Eurocentrism, their revenge for local self-organisation (including the No Borders Camp), and their compliance with the broader demands of the states of Fortress Europe. Such treachery must be exposed and stopped. Not in our names. Under the circumstances of colonialism and neo-liberal capitalism; at the roots of the reasons people are driven to seek refuge, we are driven to resist by any means necessary. Housing is a need which we assert and will take for ourselves. Food and drink are needs which we assert and will take for ourselves. Health is a need which we assert and will take for ourselves. Freedom of movement is a need which we assert and will do for ourselves. There is pride in our solidarity. We are not sorry. Refugee struggle is a necessity. Towards total liberation. Can Simit is a precarious living, anti-borders accomplice currently based in Greece, who enjoys sesame seeds.